The annual Baseball Hall of Fame election is always fuel for impassioned discussion. It goes beyond statistics to such topics as the use of performance-enhancing drugs and character. Even the process of selecting voters for Cooperstown has come under scrutiny. No other Hall of Fame generates more debate. Five Globe staff members have a vote. The results will be announced on Jan. 24, but in the interest of full disclosure, we present the Globe ballots and each writer’s explanation. Three guys. That’s it. I don’t want the Hall of Fame to turn into the Hall of Very Good. I’m not coming down off the Steroid Wall, which is an increasingly difficult and unpopular position. And I’m not letting the analytics army tell me that WAR is the perfect barometer for Hall worthiness. So my three votes on the 2018 ballot go to Jim Thome, Chipper Jones, and Vladimir Guerrero. Easy and obvious. And I can guarantee you they will all be enshrined in late July. Thome already has a statue outside the ballpark in Cleveland. He hit 612 home runs over 22 seasons and there was never a whiff of PED suspicion around him. Not bad for a 13th-round draft pick from Illinois Central College who was selected by the Tribe after Alan Embree and Curtis “The Mechanic” Leskanic in 1989. Thome has more homers than all but seven players in major league history. This is his first year of eligibility and he is going to sail into the Hall. Jones, also making his debut on the ballot, is another easy selection. By any measurement, he is one of the four greatest switch hitters in big league history. Mickey Mantle is the consensus top dog, but Chipper is near the silver-medal platform alongside Eddie Murray and Pete Rose. A career .303 hitter, Jones was equally great from both sides of the plate. He hit 468 homers and drove in more runs (1,623) than any other third baseman in history. In George Brett/Brooks Robinson fashion, he spent his entire 19-year career with one team, the Braves. See you in Cooperstown. Guerrero is back on the ballot after falling a mere 15 votes shorts in his first year of eligibility. It was silly that he didn’t make it on the first ballot. Guerrero was the ultimate five-tool player, a joy to watch, and an annual MVP candidate. Pedro Martinez boycotted Cooperstown last year after learning that Guerrero came up short. Guerrero had a career average of .318 with 449 homers and 181 stolen bases. He swung at everything, and was a little erratic on the basepaths and in the outfield, but I would have paid full admission just to watch him make throws from the outfield. So there. Those are the guys I’m voting for. As we all know, it’s the people we don’t vote for that everybody wants to talk about. Trevor Hoffman is going to Cooperstown this year. He was five votes short last year. So it’s done. He will be in a large class with Thome, Jones, Guerrero, plus ex-Tigers Jack Morris and Alan Trammell, who were selected by a veterans committee last month. But I don’t vote for closers unless they are Rich Gossage (three-inning guys), Bruce Sutter (changed the game with a unique pitch), or Mariano Rivera (the greatest of all time). There are simply too many cheesy saves these days. Hello, Craig Kimbrel. I don’t vote for Edgar Martinez, not because he was a DH, but simply because he falls a little shy as a dangerous hitter. Martinez should not be penalized because he was on a team with Ken Griffey Jr. and Alex Rodriguez, but he fails simply on my Potter Stewart “I know it when I see it” test. Sorry, Edgar fans. The WAR guys are all excited about Scott Rolen. I am not. Mike Mussina won 270 games, all in the American League East. But we’d all take Luis Tiant or Curt Schilling in a big game over Mussina. And they are not in. Omar Vizquel is a tough omission. He won 11 Gold Gloves with a career batting average of .272 in his 24 seasons. I’ve given him a lot of thought. I’ve talked to guys who watched him every day. But I just can’t do it. Vizquel was an All-Star only three times in his 24 seasons, therefore not dominant at a position that admittedly was stacked with greatness (Jeter, A-Rod, Nomar) in the years he played. As for the Roids Boys. I’m still holding out — and not because Joe Morgan asked me to stay on the wall with his November letter to the voters. I realize the whole thing is crumbling and I am sure David Ortiz is going to gain entrance when he first becomes eligible, but I’m out, even though it’s tough not to vote for talents like Roger Clemens and Barry Bonds. Finally, I’m putting Schill in a corner for another year. He thinks he’s not getting elected because he’s a Trump guy. That’s not it. Schill is a borderline candidate. He has received less than half the aggregate votes in his five years on the ballot. You need 75 percent. Schilling’s ERA (3.46) is higher than Kevin Brown’s (3.28). His win total (216) is comparable to Jerry Reuss’s (220). His strikeouts per season (155.8) are fewer than Mickey Lolich’s (177.0). None of those other pitchers is in Cooperstown. In fact, in Baseball Reference’s similarity scores, not one of the top eight pitchers most similar to Schilling is in the Hall of Fame. And none of them felt a need to call Adam Jones a liar. Cue the ridicule. I’m voting for Johnny Damon. His body of work is borderline at best for induction into the Hall of Fame. But voters have long shown their standards are as squishy as Silly Putty, and I’m straying from convention this year to recognize Damon’s transformative role in Red Sox history. Damon’s marquee teammates — Curt Schilling, Pedro Martinez, Manny Ramirez, and David Ortiz — rightfully received much of the glory for the Sox breaking the franchise’s 86-year championship famine in 2004 with their historic comeback over the Yankees in the American League Championship Series and their sweep of the Cardinals in the World Series. But it was Damon more than anyone who purged the franchise’s self-defeating culture of doom, making possible those watershed moments. Long before Kevin Millar let loose his “Cowboy Up’’ rally cry and Martinez introduced his miniature human charm, Nelson de la Rosa, Damon arrived as a free agent from Oakland before the 2002 season and infused the Sox clubhouse with a sense of desperately needed optimism. As recently as 2001, the clubhouse had been rife with malcontents, who, in the words of Trot Nixon, “disrespected the Red Sox uniform’’ and themselves. Principal among them was center fielder Carl Everett, whom Damon replaced. Into the quagmire Damon strode, daring to vow — two years before Schilling’s memorable pledge — that he would help conquer the franchise’s storied curse. For the next three years, Damon did what few other Sox players had done: He mastered ways to protect his thinner-skinned teammates from the daily pressure of playing in Boston. As a preeminent team builder, he committed to facing the often prickly media before and after nearly every game, addressing almost any thorny issue that arose while sparing his teammates from the tension. That ritual alone — one of Damon’s many intangible contributions that defied statistical measure — helped the Sox thrive. By 2004, Damon was a wild-maned cult figure who helped to create a brotherhood of championship-caliber, stress-resistant “idiots.’’ Then he all but singlehandedly buried the Yankees in Game 7 of the epic ALCS by driving in six runs with a grand slam and a two-run homer, en route to the cathartic World Series sweep. Damon departed after 2005 for a four-year stint in the Bronx, where he helped the Yankees win the 2009 World Series. He later played for the Tigers, Rays, and Indians before he retired in 2012. A two-time All-Star, Damon finished short of his quest for 3,000 hits with 2,769, but he scored a Cooperstown-caliber 1,668 runs. He led the AL with 46 steals in 2000 and finished his career with 408. He ranks ahead of many Hall of Famers in games (2,490), at-bats (9,736), and doubles (522). And he achieved a higher career WAR (56.0) than Hall of Famers Tony Perez (53.9), Kirby Puckett (50.9), and Jim Rice (47.4), despite his relative lack of power and weak arm. Stats maven Bill Chuck notes that Damon is one of only two players in baseball history with at least 2,700 hits, 500 doubles, 1,000 walks, and 400 steals who are not enshrined in Cooperstown. The other is Barry Bonds, a Hall of Fame talent stymied by steroid allegations. Damon has little chance of reaching Cooperstown, but he should be “immortalized forever’’ for helping to end 86 years of New England heartache. I’m voting for two other first-time candidates: Jim Thome and Chipper Jones. Thome hit a Hall-worthy 612 home runs and compiled a .956 OPS over 22 seasons, while Jones won the National League’s Most Valuable Player award in 1999 as well as a batting title (2008) and World Series ring (1995) during his consistently productive 19-year career with the Braves. I continue to penalize candidates who I believe, based on the best available evidence, cheated with performance-enhancing drugs: Ramirez, Bonds, Roger Clemens, and Sammy Sosa. No voter can be sure if any player was entirely clean. But without strong evidence to the contrary, I am casting ballots again for Schilling, Mike Mussina, Edgar Martinez, and Trevor Hoffman, while adding a deserving second-year candidate, Vladimir Guerrero. That leaves two open spots on my ballot, and while several other candidates may one day be worthy, I’m standing pat for now. The Hall of Fame voting process is charmingly old-fashioned. The ballot arrives in the mail and you’re instructed to check off boxes on a standard sheet of paper and mail it back. It’s everything else that gets complicated. Comparing players is less about math and more about personal preference. What one voter believes is important may be completely different from another. This ballot is a great example of that. Trevor Hoffman will be an easy choice for many voters and Scott Rolen likely won’t receive more than 20 percent. But I voted for Rolen and not Hoffman. Ultimately, I selected nine players. Barry Bonds, Roger Clemens, Vladimir Guerrero, Edgar Martinez, Mike Mussina, and Curt Schilling were on my ballot last year and stayed there. The newcomers were Rolen, Chipper Jones, and Jim Thome. That the Hall of Fame does not want Bonds and Clemens in has become obvious. Cooperstown changed the rules in 2014, deciding players would remain on the ballot for only 10 years instead of 15. So after this year, Bonds and Clemens have only four more chances with the writers. Clemens got to 54.1 percent last year and Bonds to 53.8 percent. That apparently was too close to the required 75 percent. A few weeks ago, Cooperstown staffers provided administrative support to Hall of Famer Joe Morgan to send a cloying email to voters asking them not to vote for PED users because they cheated. Morgan is welcome to his opinion, but it’s a useless ploy. I see my responsibility as judging players in the context of their era, not to punish suspected cheaters because MLB and the Players Association weren’t willing to at the time. Guerrero, who received 71.7 percent of the vote last year, is sure to get in this time. His accomplishments compare favorably to a number of players already in the Hall. Edgar Martinez is another candidate on the rise. That he was a designated hitter is not a detriment. Mussina’s candidacy requires looking beyond false standards such as 20-win seasons. He is 20th in career strikeouts and pitched to a 3.68 ERA at the height of the Steroid Era in a career spent in the unforgiving ballparks of the American League East. Schilling passes every statistical test that matters and dominated in the postseason. That he holds many detestable social views has nothing to do with this discussion. Jones was an easy call. Few third basemen in history can match what he did. Thome was an obvious choice, too. He had 612 home runs, 1,699 RBIs, and scored 1,583 runs over 22 seasons. That he never finished higher than fourth in the MVP voting comes as a surprise, but a career .956 OPS renders that moot. Rolen was not somebody I was inclined to vote for at first. But the more you dive into his career numbers, the harder he is to ignore. Rolen won eight Gold Gloves at third base and hit 25 or more home runs seven times. From his age 25-34 seasons, he had an .865 OPS. Rolen will not get in this year, but he is somebody who should stay on the ballot and be subject to further consideration. So he got my vote. As to who came close on my ballot, that was a fairly long list. Hoffman, who had 74 percent of the vote last year, will get in this time but without my support. I can’t be convinced he was a better pitcher than Billy Wagner, who received 10.2 percent last year. Wagner was better statistically across the board but had 179 fewer saves. Given how useless the save stat is, should that matter? Relievers are a dilemma. Johan Santana (50.7) and Jamie Moyer (50.2) had a much higher WAR than Hoffman (28.0) or Wagner (27.7). Hoffman was unquestionably more famous than those starters. Whether that makes him more deserving is another question. Omar Vizquel was another tough call. He was a tremendous defensive player, but also had a .336 OBP and a .352 slugging percentage. If you compare Vizquel with Luis Aparicio or Ozzie Smith, he should be in. But he played in an era when shortstops emerged offensively and had a career adjusted OPS of 82. Jeff Kent, Gary Sheffield, and Larry Walker were also close calls. Manny Ramirez was not. He twice failed drug tests after a program was implemented. He knew the consequences and chose to ignore them. I’ve been voting for the Hall of Fame since 1994. I must say that it’s never been an easy process. For the most part, I’ve stuck with candidates all the way through either their induction or their removal from the ballot. Advanced analytics have come into play more over the years. While I take heed of those numbers, I adhere to the old-school approach first and foremost: You know a Hall of Famer when you see one, which is why I continue to vote for Barry Bonds and Roger Clemens. I have no idea when and if they started using steroids; all I know is that when I watched them perform — likely against other players who dabbled in PEDs — they were the most outstanding players on the baseball field. And yes, I have convinced myself that every era has had its vices. When Hall of Famer Joe Morgan recently put out his impassioned letter to the electorate asking them to not vote for known steroid users, I respected the position he took. But I can’t get past the fact that players of Morgan’s era took amphetamines to enhance their performance. No, the “greenies” didn’t make them stronger, but they made them more alert and sharpened their ability to perform. In those days, there were more day games and players stayed out late and drank and had their fun. In order to perform the next day, they needed a boost. Amphetamines were readily available in clubhouses. And I doubt that many players had prescriptions for them. That’s why amphetamines are now banned — they enhance performance. My ballot this season contained a few newcomers. First-time nominees Chipper Jones and Jim Thome are no-brainers. Jones was one of the greatest switch hitters of all time, and Thome was one of the most feared sluggers to ever play the game. His 612 homers, 1,699 RBIs, and .956 OPS are off the charts. Omar Vizquel’s incredible defensive work at shortstop that led to 11 Gold Gloves, plus a respectable .272 batting average, put him on my ballot. Vladimir Guerrero, who fell a smidgen short a year ago (71.7 percent), makes my ballot, as does closer Trevor Hoffman, who also came very close a year ago with 74 percent. Both should get to the 75 percent needed this year. I have stuck with Mike Mussina (51.8 percent) and Curt Schilling (45 percent). Mussina won 270 games pitching primarily in the AL East, which during his run was the toughest division in baseball. The lineups he faced were tremendous. Schilling’s postseason numbers — 11-2, 2.23 ERA — put him over the top. His strikeout-to-walk numbers (3,116 to 711) are astounding. As I said, once I vote for a player, I usually stick with him all the way through. Two such players were Jack Morris and Alan Trammell, neither of whom made it until the Veterans Committee elected both to the Hall of Fame last month. With only 10 spots on the ballot, I had to make a tough choice, and what I decided was to drop Jeff Kent (whom I will vote for again) and replace him with Vizquel, the American League’s version of Ozzie Smith. Again, in this era of analytics, you can make a case for others. I have left off Edgar Martinez, never feeling his numbers were quite good enough. I know he was a tremendous hitter, but his 2,247 hits, 309 homers, and 1,261 RBIs fall a little short for me, though his .933 OPS was magnificent. Also on the border for me are Fred McGriff, Larry Walker, Scott Rolen, Andruw Jones, and Johnny Damon. Yes, Johnny Damon. I hope he stays on the ballot because he deserves further consideration. A leadoff hitter and center fielder for most of his career, Damon is one of eight players in history with 2,700 hits, 500 doubles, 1,000 walks, and 400 steals. 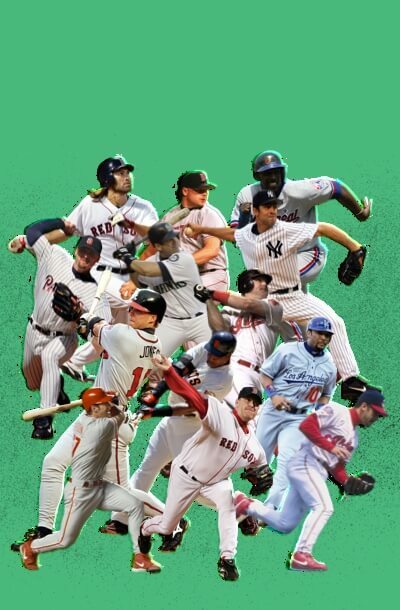 The others are Ty Cobb, Tris Speaker, Roberto Alomar, Barry Bonds, Rickey Henderson, Craig Biggio, and Paul Molitor. Other than Bonds — who should be in — all are Hall of Famers. I’m also questioned a lot about my vote for Gary Sheffield. He hit 509 home runs (26th) and had 1,676 RBIs (28th). He had a career .907 OPS. He had 2,689 hits. His 162-game averages were .292, 32 homers, and 105 RBIs over a 22-year career. Other than Dave Winfield, I’m not sure anyone hit the baseball any harder than Sheffield. That day has yet to come. Once again, I could not bring myself to check the names of Mssrs. Bonds, Clemens, and Sosa on the 2018 Baseball Hall of Fame ballot. Is any further explanation necessary? Just couldn’t do it. Maybe next year. So whom did I vote for? You may know him from his Angels days, but the National League set well recalls when he was a terror north of the border. He had a ridiculous seven-year run with the Expos in which his OPS numbers ranged from .833 to 1.074, but for all we knew he was in the Sluggers Protection Program. Rumor has it he occasionally swung at actual strikes, but I have not been able to substantiate this. Only question is just how high the vote tally will be. I’m calling 90-plus percent. One of the all-time great switch hitters and among the greatest handful of third basemen who ever lived. He can start preparing the speech. I’d love to see the AL-oriented/NL-oriented voter split on him. Hey, National League DH deniers: This guy was the most respected hitter in his league for 10 years. They named the DH award after him. Put him in! He was 270-153 lifetime, and that entire baseball lifetime was spent in the treacherous AL East. I admit I was stupid and slow to come around, but now he gets my vote every year. Exited with 20 W’s. Gotta love that. I don’t want to have a beer with him. I don’t want to engage in a political debate with him. But I’d sure like to see him pitch again. My contention is that the only time he wasn’t not just good, but great, was when he was injured. His right-wing bluster has to be the reason people won’t vote for him; I can’t come up with any other intellectually defensible explanation. Gee, aren’t 612 homers reason enough? Batted cleanup for the AL in the 1999 Fenway All-Star Game. Just sayin’. Ahead of his time. Odds were good that the ball would not be in play because verrrry often it was (a) a K, (b) a walk, or (c) a bomb. And he hit some amazing opposite-field and straightaway bombs. I think it will be close, and I will not be surprised if he has to wait a year or two. Played in the shortstop shadows of A-Rod, Nomah, and, of course, Jeter. A consummate fielder — I said consummate — fielder, and teamed with Hall of Famer Roberto Alomar to form the best DP combo I ever saw. Yes, I am partial to defensive whizzes, and I refuse to apologize for it. Oh, and he sneaked in 2,877 hits when you weren’t looking. P.S. Greatest defensive 40-year-old at any position ever. Period.